Butter, cream, cheese, are all part of this beloved Classic Alfredo Sauce recipe. The interpretations can vary widely, somewhere between bland and flat to overly salty and processed tasting due to fillers in place of real cream. I avoid ordering Alfredo in restaurants for that reason, never knowing which side of the spectrum to expect. I like this recipe for its accents of garlic, lemon, and mix of Parmesan and Romano cheeses. 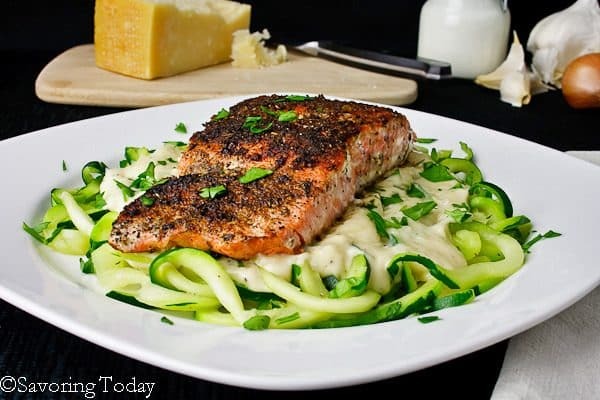 Remarkably easy to prepare at home, this simple sauce creates the perfect canvas for all sorts of enhancements like Cedar Plank Grilled Chicken, Blackened Salmon, sautéed shrimp, spiralized (as shown) or roasted vegetables. Gluten-Free Option: Use spiralized vegetables or any favorite gluten-free pasta as a substitute for wheat pasta, try Ancient Harvest Quinoa or Jovial brand if you are uncertain which to use. Butter, cream, cheese, are all part of this beloved Classic Alfredo Sauce recipe with accents of garlic, lemon, and mix of Parmesan and Romano cheeses. Cook the pasta in a pot of rapidly boiling salted water until al dente. Drain in a colander, reserving 1/2 cup of the pasta cooking liquid. Return the pasta to the pot it was cooked in, set over medium-high heat along with 1/4 cup of the reserved cooking liquid (reserve the other 1/4 cup to thin sauce, if needed). Add the butter-cream mixture, half of the Parmesan, all the Romano, and toss to combine thoroughly. (Thin with pasta water if desired.) Salt to taste. Sprinkle with remaining Parmesan and garnish with parsley. Serve immediately. Grilled chicken, sautéed shrimp, blackened salmon, or roasted vegetables can be served on top of the pasta or combined with the sauce just before tossing with the pasta. I love Alfredo Sauce, and your version sounds just wonderful. I like the addition of the lemon juice. Thank you for sharing this post with the Hearth and Soul Blog Hop. YUM!! I love alfredo. This looks yummy and I love your recipe. I make a 4 cheese fettucini sauce that is super good..
Raquel, I applaud your efforts to understand what you are eating and monitor/control ingredients, we are diligent about this same thing. Alfredo has received a bad rap because of its fat content, though it is all good fats. Yes, good fats. Obviously, portion control is key with any meal and a generous serving of vegetables with this recipe is important. 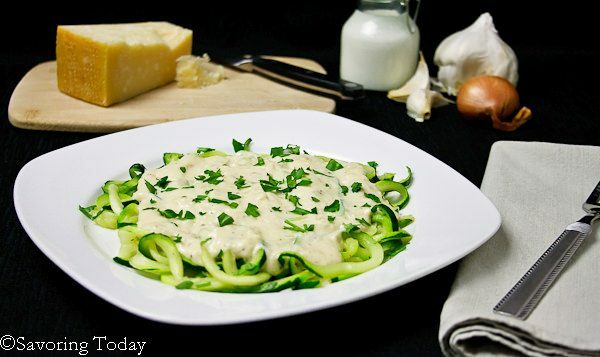 With proper meal rotation (variety), quality ingredients (no low-fat or artificial stuff), and portion control, there is no reason to avoid a real cream sauce now and again. Good for you for paying attention to nutrition. My favorite is with blackened salmon.